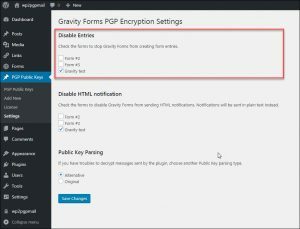 Gravity Forms PGP Encryption plugin allows you to receive encrypted emails from your visitors, without the need for them to use any specific software. To achieve this, the plugin only uses your PGP public key. You can test our online PGP key generator. a public key, which other people use. A message that is encrypted with one of these keys can be decrypted only with the other key in the pair. For example, let’s say that Alice wants to send a message to Bob. She encrypts the message with Bob’s public key and sends it using her favorite email program. Once the message is encrypted with Bob’s public key, only Bob can decrypt the message using his private key. Even major governments using supercomputers would have to work for a very long time to decrypt this message without the private key. Gravity Forms PGP Encryption plugin helps you to simplify the process: any form submitted by a visitor on your website will be automatically encrypted with your public key, and will be sent to you. Your visitors have just to fill the form like usually, they don’t have any special action to do. Gravity Forms PGP Encryption plugin allows you to receive encrypted emails from your visitors, without the need for them to use any specific software. To run the plugin, you need a website with WordPress and Gravity Forms. No. You need to purchase the plugin, and you need to have Gravity Forms as a requirement. However, you can use the free version of the plugin. The free version has its own static form, you can use it without Gravity Forms. I need a PGP keypair. Fill the fields Name, E-mail Address and Password, then click on Generate PGP Keys. You will get a public and a private key. Save them as text files on your computer. The installation instructions are available here. Does my website need a SSL certificate? We highly recommend that you use SSL on your domain, but it is not required. If you use SSL, data will not be transfered in clear between your visitor’s computer and your server, so all the process will be safe. You can purchase SSL certificates with our partner. How do I decrypt messages? To decrypt messages, you can use our online PGP tool or any other PGP software. A list is available here. Can I have multiple recipients? If you have a problem to decrypt message, feel free to send us a screenshot of the error message you get, and copy/paste your public PGP key on the form below. It would help you to properly configure your mail settings, and you will be able to send a test mail to yourself. How do I revoke the public key? We do not save any data about PGP keys generated on the website. You have nothing special to do other than stop using the key. Emails are coming through as HTML. Does the plugin support PGP/MIME? No. The plugin doesn’t support PGP/MIME yet. All the messages are sent in plain text. Can I encrypt images or files? No. Encrypting files from the form is not yet possible. However, you will receive the link to the file encrypted, as any other field. We are checking the code of the plugin when there are security alerts about WordPress, to know if we are concerned or not, and if we need to do an update. Usually, we are doing seven or eight updates a year, depending on security and feature issues. The updates are done automatically when the license key has been entered in the settings of the plugin. The updates appear on the Plugins page like any other plugin. The updates are included during the first year. After the first year, a small fee will be ask to you to continue. However, the plugin will still continue to work even if you don’t renew the license. I have lost the download link. If you have lost your download link, open a new ticket by filling the form below. With our plugin, you will be able to add a secure contact form on your website. Patients will fill the form, then the results will be encrypted with your public PGP key and sent you by e-mail. So you will get in your mailbox an encrypted e-mail. You will need your private PGP key and your password to read it. Be aware that the encryption is done on your server, so it’s highly recommanded to have SSL on your WordPress. With SSL, data is encrypted between your patient’s computer and your server. So the whole process is protected. If you need help and you don’t find any answer on this page, please open a new support ticket by filling the form below. Gravity Pushover plugin allows you to easily send instant push notifications on your phone when a form is submitted on your website. Gravity Forms must be used to manage the form and Pushover must be installed on your device.What are the requirements? Yes, but you need to have Gravity Forms and a Pushover account as requirements. Can I use my own Pushover application? Yes, you can use your own Pushover application if you have one. You will need to enter the Pushover application token in the setting page. I don’t receive any notification. Check if you have a valid Pushover account and if the plugin is correctly set up. How to set up my Pushover account? The Change Log for Gravity Pushover plugin is not yet available. All our servers are in Europe at OVH, and we are GDPR compliant. Concerning the PGP Key Generator, we DO NOT record any data: no e-mail address, no password and no messages. If you wish to place an order, your details will be requested. If you have purchased any license, your details will be kept as long as your license is valid and will be deleted after one year your license is expired. If you have purchased any license, your e-mail address is imported in our mailing list to keep you informed about important updates. You can unsubcribe at anytime. Copyright 2009 - 2018 wp2pgpmail | All Rights Reserved | wp2pgpmail is not affiliated with Rocketgenius Inc., nor Superblock, LLC. Our partners and ourselves use different technologies, such as cookies, to personalize content and analyze traffic. Please click on the button to give your consent. Show all intended uses. Our partners and ourselves use different technologies, such as cookies, to personalize content and analyze traffic, especially for security reasons. - Cloudflare, our website security platform, automatically assigns a cookie without collecting any personal information. For other services, you can adjust all cookie-related settings by navigating through the tabs on the left side. This website uses Matomo (formerly Piwik), a software installed on our own servers, to collect anonymous information such as the number of visitors to the site, and the most popular pages.